As the winter season has officially started and temperature are likely to go down into the single figures over the next few days (and nights), it’s about time to start thinking at what you can do in order to keep the temperature in your house nice and cosy – but also to keep your energy costs down. One of the most important pieces of advice is to clear the area around radiators f any furniture that could compromise its effectiveness. A hefty item positioned in front of a radiator will absorb its warmth, leaving less for your living space. In a cooler room with a blocked radiator, you’ll have to adjust the thermostat to compensate. This change is straightforward and shouldn’t require too much time. Simply locate the radiators in your house or apartment unit, and make some slight rearrangements to the furniture in those rooms. It costs you no money at all, and you’ll likely notice an immediate difference in the temperature. Further measures to bolster your radiator’s effectiveness include installing a thick pair of curtains, thermal or otherwise, that will trap heat within your home. They’ll sustain the temperature of your space and keep it nice and cozy. On a sunny day when clouds and inclement weather don’t threaten your comfort, you can open your curtains to let the sunshine in and enjoy the natural light. You can choose from a broad selection of different window coverings to improve your energy efficiency. Tightly installed cellular shades can reduce heat loss through your windows by an incredible 40 percent or more. These same shades serve the opposite purpose in spring and summer, protecting against solar heat. Last, but certainly not least, one can make the best of their radiators by carefully controlling their exact start and shut down times, as well as their exact temperatures – all achievable with the help of the Heat-Save wireless thermostatic radiator valves. 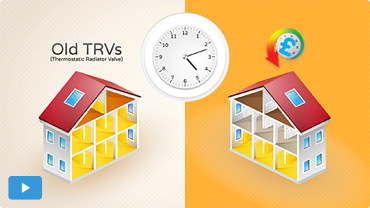 Savings of up to 30% on average energy bills can be achieved when using the HeatSave wireless thermostatic radiator valves together with the HeatingSave Building Management Systems (BEMS), thereby optimizing energy consumption across your home.